Children outside school. St Peter’s and St Paul’s Primary School, Pilkington Street. Like I said I was in that primary school from 1961-65. I can remember on the corner Pilkington Street / Houghton Street was a small corner shop where we children could spent their pocket money on sweets and chocolate before and after school. I was at St Peter and Pauls from 1960 then left to go to English Martyrs. I have lovely memories of school , going across the road in Pilkington Street to the dinner hall! I loved Connies shop no matter if we were late for school or not we had to call for a penny dainty . My name then was Gail Stanton .. I went to English Martyrs from 1961 to 1965. I remember Mr Proctor, the first head teacher there, who went into pension after my first year and was replaced by Mr Mercer. Mercer was terrible, talk about fire and brimstone. The guy loved fuming around on stage in front of the whole school about his pet hates. Sister Emelda was a saint in comparison. I was the same time at Peter & Pauls (’61-’65) and changed to Thornleigh College 1966. Later on 1969 I moved away from Bolton to the South of Germany (Nuremberg), the area where I live now. I also bought after school sweets at Connies with the rest of my day’s pocket money. Do you still remember the yearly Christmas play each class had to perform in the school hall?? I always was a cow or a mule. I went to St. Peter and Pauls school too. I am 48 years old now, I have fond memories. I think I started in 1969 at the nursery then primary school. I remember the French teacher ‘Madam’ very well and Miss Rothwell. I have been living in Italy for 23 years but still go back to see my old school when I am home. If anyone has any photos of that time, I would love to see them. I was at St P & P from 1950 – 56, when it was an all age school. My mother taught the ‘top class’ – 15 year old girls. When it became a primary school she taught Junior 3 for a few years before moving to St Osmunds. I remember the teachers mentioned but also particularly Miss McEvoy who was the teacher I remember best as a child. Oh I remember Mrs Vanstone, Miss Smith and Miss McEvoy . I do remember you as well Sally but I think you are a tad younger. My maiden name was Orrell. I have lived in Canada for 50 years. I was a Nurse and then Nursing tutor here . Great education at St Peter and Pauls and great teachers. Good Memories. Hello Sally I remember a Mrs Vanston at st Osmunds in late fifties. Could that be your mum? Well boy do I remember St Peter and Pauls (1961-1966) Nuns always canning you, and a certain teacher I wont name him making you eat ya food until you where sick oh yeah happy days. Yep, I remember St P&P only too well, especially one certain rabid teacher who felt caining at least one kid per lesson was part of her job. Or having to eat my meals up, regardless if I was throwing it up at the same time. And yet I also have quite fond memories of the place. In my last year there, 1961, I had Ms. Johnson as class teacher who, although extremly strict, was one of the best and fairest teachers I’ve ever had. I’d discovered my artistic side in those days and liked to draw sailing ships that she would then hang along the back of the class room for all to look at. I can’t forget those parades because we had to go to school on a weekend day, I do believe on Saturday, and then march around the area behind a brass band in our best Sunday clothes with shining shoes and a smiling face. I do believe the parade ended in the P&P church for a ceremony of two hours blessing the church. Later on I liked those parades because I played baritone in the Thornleigh brass band and after the parade we got a meal and drinks for free. I can’t forget sister Emelda because I once to often got her cane on the back of my hands because one of the nuns new for sure that I was not in church the Sunday before!! Conny from the corner shop always built up a little sales stand in her doorway with all kinds of sweets so she could sell to the kids without need of entering her shop on there way to and from school. She didn’t want the children to enter her shop. Sorry to intrude but I am a Master’s student working on a thesis relating to ‘Sunday Best’ and what this means in terms of dress both past and present. As part of my research I would be very interested in speaking to anyone who remembers wearing their ‘Sunday best’ as a child particularly what they wore and how they felt. If you would be willing to speak to me please contact me by email my address is masonlisajane@gmail.com. Any assistance would be very much appreciated. I have a school photo of my father James, his twin Tom and his classmates in the school yard at SS Peter & Pauls dated about 1911. I remember the long walk to Mass each Sunday in the late 1950’s and 60’s. Will share photo if anyone has a real interest. Interesting. That will be one rare photo if you think of the expense of photography in those days. I for one would like to see it. We used come down by bus from up St Helens Road/Hulton Lane to P&P for Sunday mass somewhere late 50’s early 60’s. Half the time I couldn’t be bothered going though and rather slept in. Then come Monday interrogations at school I’d have found out the priest’s name giving mass and lied my way through. Worked a treat every time. Thankfully later at English Martyrs RC they gave up interrogating us. But for that there they had a different repression system with houses, merit badges, good and bad marks, conduct marks (god forbid!) the slipper on the bum in front of the whole school, vicious, power mad prefects and lots more terrifying things. But that’s another story. Do you know how I upload the photo, all the photos here seem to be Bolton Council copyright jobs ? I used to live close by St William’s school, quite a hike down to 11 o’clock mass at SS P&P. Think it was Fr Delaney there aka Dean Delaney when I used to go. Too many people used to know me at St Bills, my mother used to clean at the presbytery there. 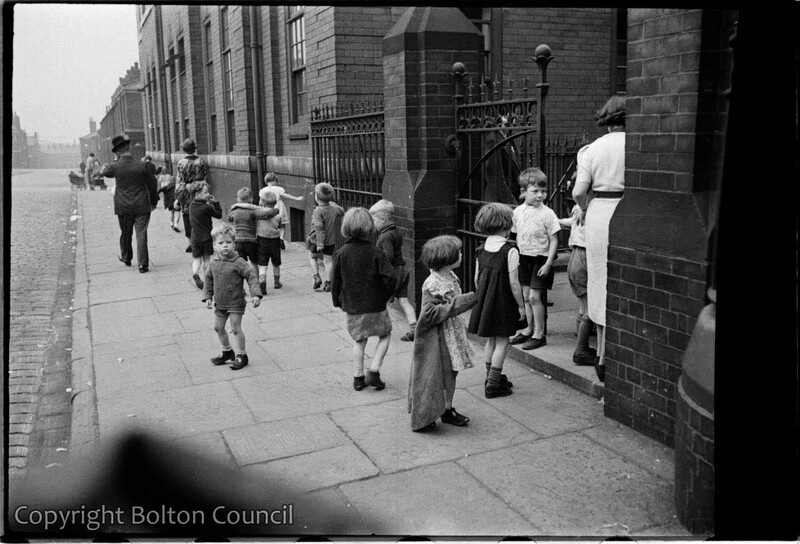 you were asking how to upload photos onto the Bolton Worktown site. I tried contacting the people running the site a week ago about this and was told that someone will get around to helping me as soon as poss. I’m still waiting and will inform you as soon as I know more. BTW. You addressed my brother, Andrew, but I got your mail. Hope it’s no prob to you. Unfortunately there isn’t a way for commenters to add images though we can do this on your behalf. If anyone has anything directly related to the Worktown project then we would be very interested adding it to our blog. Hi Michael, we lived a couple of doors from you, hope you remember us? Anne, Michael, Susan, Gina and Catherine? those interrogations every Monday morning I can remember well, I did also the same like you asking the class mates the priest’s name giving mass but once I did a big mistake. I got late to school and couldn’t ask the priest’s name so I thought I would be clever and said I went to a different church hoping that the nuns didn’t know all the priest’s names. The big problem was I named a church and that church happened to be a protestant church, the nuns went mad, that was a mortal sin for a catholic to visit a protestant church. I got into arrest and got the cane onto my backside. The nice thing was, at the end I told my mother the story and she went on the next day to P & P school and played hell with Sister Emelda because she was protestant and said she could take me any time with her to her church. I’ll never forget that. I can remember those interrogations stopped as I changed ’65 to Thornleigh boys College because the teachers there had more to do then to ask who was at church on Sunday. I left Thornleigh 1969 when I moved to Germany. 2013 I got the idea of driving past Bolton to see what has changed, well I was amazed and really had problems identifying certain parts of Bolton. I then visited Thornleigh and was further amazed to see it hadn’t changed very much except that it is now a mixed school. I walked through the corridors with a tear in my eye and could remember playing the baritone in the brass band from Farther McGovern. I will go past again to see if the headmistress is still there. Maybe someone else was with me in the time between 1965 till ’69? 1971 then Thornleigh was still a boys school? Can you remember when Thornleigh changed to a mixed school? Wasn’t father Fox a headmaster in Thornleigh, but I am not sure. Otherwise, yes I can remember most of those teachers but most of the names I have forgot now. I don’t know any more in which house I was but I think it also started with St. A…. maybe you know? What have they built on the ground area of the demolished St Peter & Pauls church? Thornleigh changed from grammar school to comprehensive in 1979 I think . Hi I was at P&P in the early 70’s . Sister Imelda was the headmistress and I loved her….I had the job of ringing the breaktime bell. We went to a building on Shaw Street for lunch and I had the privilege of being a server. I went on to Mount St Joseph school (Dean) where Sister Barbara was the headmistress . I was there from 66 to 72 and also went to The Mount afterwards. That dining room / prefab was terrible but handy for scraping unwanted food out of the window. LOL! Scraping unwanted food out of the window! That is the funniest thing I’ve seen posted here yet. And yes, the food was sometimes atrocious and only fit for being scraped off the plate out of the window. Hi Lyn, that was a nice way of discarding not wanted food, I had class mates they stuffed their unwanted meals into their pockets to get rid of it on the way home in the evening. They sat in the classroom smelling according to the schools dinner and got followed on their way home by all the dogs in the area. How nice! sister imelda was what!! she was a monster. Hi my name is Michael Ackers. l attended St Peter & Paul’s from 1953 /1959 we lived on Derby St .l remember Connie’s corner shop selling from the penny tray the lucky bags filled with Coco powder and sugar balanced on sterilised milk milk crates. l also remember May Queen walks &Trinity Sunday we had a May Queen,Earl Marshall &Train bearer l was a train bearer dressed in satin shirt blue velvet trousers. Hello Michael and Andrew Kobzan…..my brother Michael Stephenson and myself Anne Stephenson believe and hope you are the family that lived a few doors away from us on St Helens Rd ….we lived at 497…. very happy to hear from you. It’s been a very, very long time. And yes, we still remember you all. It would be very sad if we didn’t. Sorry my answer took so long, evidently newly posted comments here take a while before the addressee is actually informed of them. I suppose by now your brother has told you that he’s finally managed to find me through one of my nephews on facebook. You can get my email address from him if you’re interested. Hope to hear from you all again in the near future.